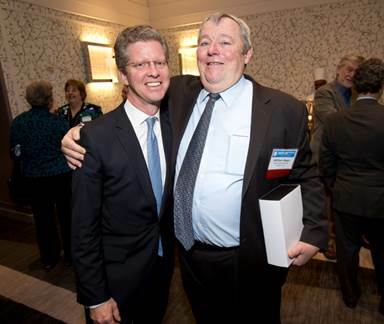 WASHINGTON, D.C. – At the National Low Income Housing Coalition’s (NLIHC) Annual Housing Leadership Reception on March 3, NLIHC honored Office of Management and Budget (OMB) Director and former U.S. Department of Housing and Urban Development (HUD) Secretary Shaun Donovan with the Edward W. Brooke Housing Leadership Award. NLIHC also honored former Federal Housing Administration (FHA) Commissioner and current NLIHC Board Member Dr. William Apgar with the Cushing Niles Dolbeare Lifetime Service Award. Each year, NLIHC recognizes two individuals who have demonstrated exceptional leadership in advancing socially just public policy to assure people with the lowest incomes have decent and affordable homes. The Edward W. Brooke Housing Leadership Award is named for the former Massachusetts Senator who championed low income housing in Congress and later served as the Chair of NLIHC’s Board of Directors. NLIHC presents the Brooke Award to individuals who advocate for affordable housing on a national level. The Cushing Niles Dolbeare Lifetime Service Award is named for NLIHC’s founder, who is considered the godmother of the affordable housing movement. NLIHC presents the Dolbeare Award to individuals for their lifetime of service to affordable housing. Shaun Donovan has committed his life to service in the public, private, nonprofit, and academic sectors. Mr. Donovan was sworn in as the 40th Director of OMB on July 28, 2014. Prior to OMB, Mr. Donovan served as the 15th Secretary of HUD, where he managed the Department’s $47 billion budget – helping families buy homes, assisting households avoid foreclosure, revitalizing distressed communities, and combating homelessness. While at HUD, Mr. Donovan made critical investments to speed economic growth, stabilize the housing market, and serve the housing needs of low income families. Mr. Donovan served as acting FHA Commissioner during the transition from President William Clinton’s Administration to that of George W. Bush. Prior to his first service at HUD, he worked at the Community Preservation Corporation in New York City, a nonprofit lender and developer of affordable housing. He also worked at the Joint Center for Housing Studies at Harvard University and as an architect. For more than four decades, Dr. William Apgar served in various positions at Harvard University. Most recently, Dr. Apgar served as a Senior Scholar at Harvard’s Joint Center for Housing Studies and as a lecturer in Public Policy at Harvard’s Kennedy School of Government. At the Kennedy School, he taught courses on housing and urban policy. His research focused on housing, community and economic development, housing finance, and capital markets. At the Joint Center, he led the Credit, Capital, and Communities Project, a multiyear evaluation of the impact of the changing structure of the mortgage industry and related capital markets on efforts to expand access to affordable homeownership and rental housing opportunities. From 2009 to 2011, Dr. Apgar served as a Senior Advisor for Mortgage Finance in the Office of the Secretary of HUD. In this role, he was involved in a variety of interagency activities to reform and restructure the nation’s housing finance system. He also served as HUD Secretary Donovan’s liaison to the Federal Housing Finance Agency — the agency charged with oversight of the Government Sponsored Enterprises — and the Financial Stability Oversight Board, the entity created to monitor the Troubled Asset Relief Program. From 1997 to 2001, Dr. Apgar was the Assistant Secretary of Housing at HUD, where he oversaw the operation of the FHA and co-chaired the joint HUD-Treasury Task Force on Predatory Lending. Active in community affairs, Dr. Apgar was a founding member of the board of the Boston-based Preservation of Affordable Housing, Inc. (POAH), a nonprofit organization that acquires, rehabilitates, owns, and manages housing affordable to low- and moderate-income households. Dr. Apgar also served as the Chair of the Board of the Homeownership Preservation Foundation. He is currently a member of the Board of Directors of the National Low Income Housing Coalition. At the awards ceremony, Shaun Donovan noted that Dr. Apgar taught and served as a mentor and inspiration to Mr. Donovan when he was a student at Harvard University. While both men are eminently deserving of their respective awards for their enormous contributions to affordable housing, the recipients’ long personal and professional connection made the evening a particularly poignant one.